from the blue chair: On quilt bees and other things. Thanks to all of you for your comments on my previous post about blogging. In reading so many of your comments it became apparent I'm not the only one still struggling with balance when it comes to this whole blogging thing. After reading the comments, I've also decided to add a new feature to my blog (which will likely replace Slash the Stash). At the end of each month, I plan to do a link-up post for your "Hallway" projects. I thought it would be fun to give everyone the chance to link up a favorite project for the month so we can each see what's hanging at the "end of your hallway". I'm currently thinking through how I will host this. Details coming. My friend Colleen, The Busy Bean, is hosting Zipper Week on her blog. She has put together several tutorials to help you out with all your zipper challenges. She is officially the zipper pro of our quilt guild. 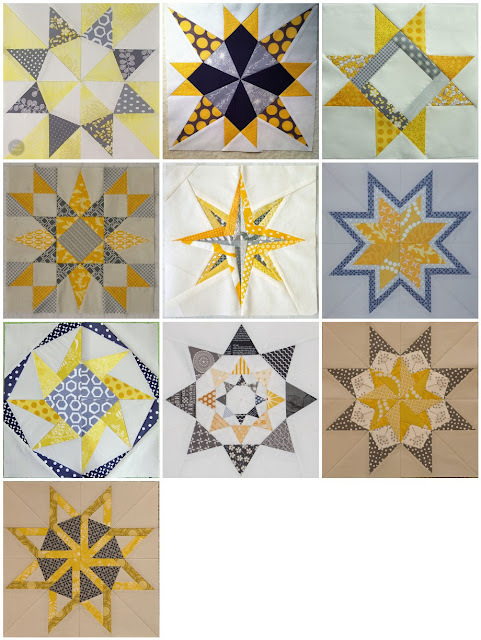 I've had several questions on various stars for my bee quilt. Here's a mosaic of those blocks currently finished. Links to the original Flickr photos are in the caption. I'll create a new mosaic in the future when more stars are finished and posted. I finished and delivered my July block for Wendy in our local bee. She asked for a 16.5" mosaic block. This will be my last block for this bee as our schedule wraps up this month. I've received a few questions on quilting bees that I was unable to respond to for lack of return email addresses. Several people have wondered how they might join a bee. There are some great resources on the Quilting Bee Blocks blog. Also check out Quilting Bee Blocks Flickr group for info. Finally my number one suggestion if you want to join a bee--start your own! Gather some of your quilting/blogging/flickr friends and start your own quilting bee. Each of the bees I participate in began this way. Someone in our group just started emailing friends to join them in a bee. My experience in each group has been great. I love the ladies in each group, and it is a fun way to get to know them a bit better. These blocks are SO AMAZING. I've loved seeing them pop up on Pinterest and Flickr. This is going to be one heck of a quilt! That is a wonderful group of stars, you are going to have an awesome quilt! And the aquas mosaic is lovely. I will watch for your new feature. Love all those blocks headed your way. I better start tidying up my 'hallway'! Looking forward to your end of the hallway feature! The stars are absolutely stunning! !What a delight! love the colours on your july block! thank you for the links. I'd like to make some of the stars, too. Your July block is wonderful. I love the colour. I wish I'd have so lovely fabrics like you have - even if it were a tiny bit of each. Your bee blocks are looking great! I think I've finally decided what to do with mine -- so I'll be sewing that tomorrow! :) It's good to see which designs have already been used! Thank you so much for this post. I want to let you know that I posted a link to your blog in Creative Busy Bee Craft Inspirations, under the Page 2 post on Aug. 14, 2012. Thanks again.